Oh yes i saw this first in your discord post. Thanks again @Sch123 ! Is it possible, for Classless Mods to be made so that when using Polearm weapons can hold it like Syl and walk / run? I tried the Fighter Hack, Slash skill, & Rip seems like the animation doesn't look right when we use weapons like Claw, Pistol. Are the Aura Skills in this Berserker Edit mod working as intended? I don't want to add it into Skills Expansion if it's buggy. -is being able to have "support" from the author of any mod. I'll get into it this weekend. Okay let's take the first Active Skill of the Fighter discipline. The "Plus" button to add a skill point to it is encircled "A" in the pic. 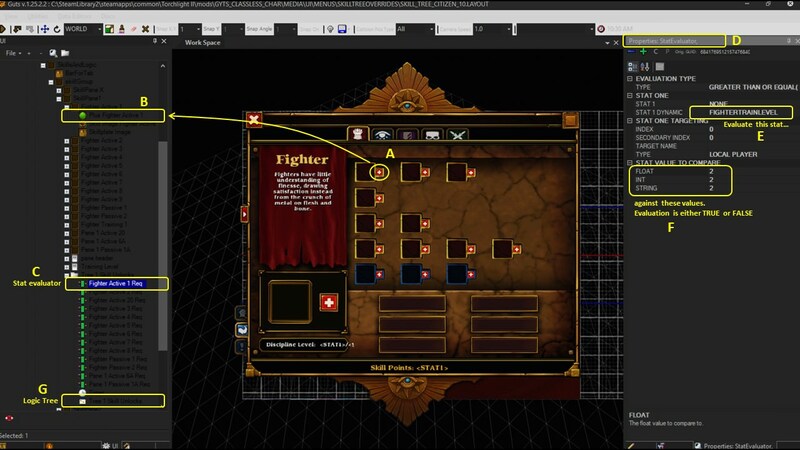 It's also a "node" named "Plus Fighter Active 1" in the ui elements tree in the lefthand panel ("B"). These are just my names, it could be anything really. This node is affected by another node named "Fighter Active 1 Req" labelled "C" lower down in the tree panel. That is a "Stat Evaluator" node and if you select it and look over in the right hand panel you can see what its settings or properties are. So we see it's set to evaluate the Stat "FIGHTERTRAINLEVEL" and check whether the value of that Stat at the time of evaluation is "GREATER THAN OR EQUAL TO" the value "2". The FIGHTERTRAINLEVEL stat is a dyamic (non vanilla) stat which increments by "1" at every level of the "Basic Fighter Training" skill using a SET STAT effect. So this is all a way of evaluating "are you at level 2 or higher in Basic Fighter Training?" So there's the Stat Evaluator "Fighter Ative 1 Req" ("A" in the pic) and it's got the 2 outputs "Evaluated True" and "Evaluated False". 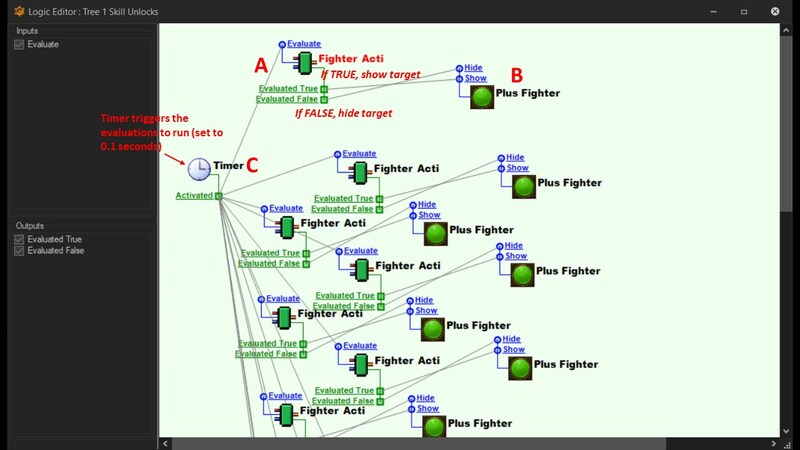 There's also the "Plus Fighter Active 1" target node ("B" in the pic. The name is truncated only when the item isn't selected). It in turn has 2 inputs "Show" and "Hide". All you do is drag a line between outputs and inputs. In this case, Output "True" links to Input "Show", and Output "False" links to input "Hide". Glad to see the basic idea is still alive. I switched the platform from the TL2 editor to Unity and learned some c# coding. Hey @DeeZire if i was able to help at all then im real happy! Hey @lolesch Unity huh? Sounds exciting and serious i hope u can share some of that with us one of these days! Oh oh OH @TwinkleToes can i take advantage of your current "pro-modding" frame of mind to ask for some help plzzz?! 1c. i read from gytfunke that any triggerable has to be explicitly removed. im not sure yet how to do this but i'm thinking of spawning an invisible dummy unit at the start of the skill with a summonduration as long as id need the curse to last. Then I'd give the unit a 100% cast-on-death skill that removes the triggerable. Too clunky? 2. 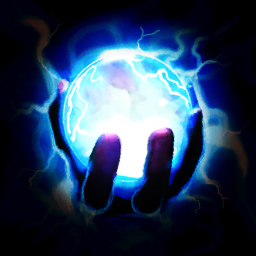 Triggerable will trigger a "curse proc" skill. Thanks heaps for any tips! Okay the idea is to achieve a capability kinda like nightcrawler from xmen - teleport over to target 1 and attack > teleport to target 2 and attack > etc. over a fixed number of chains. Epoch tried testing it (cos he liked the idea lots) and he mentioned he got it to work via spawning an invisible dummy that would pull the player over. Am pretty sure it was a dummy that would do the pull (rather than the next target hit by a damage shape) because there isnt any plain "cast skill from target" effect. So i believe (wasnt able to confirm it wth Epoch tho) it was either a "cast skill on death from effect owner" by a dummy that is killed by the player, OR a plain "cast skill on death" and the dummy has a very short summonduration. I guess im kinda asking if you can help me map-out a "code plan" for this one plz? i tried something like this with one of plaugelords skills, but found out that triggerables applied to targets is really buggy and they take extra work to make. Okay i think i know which skills youre referring to. problem i see with a cast-skill-on-struck proc is, wont it cast no matter who hits them? or you could make the triggered skill give you a stat and have a hidden passive triggerable that watches for the stat to increment and proc the triggered skill off that. Okay thanks I think i can run with this method - thanks mucho!